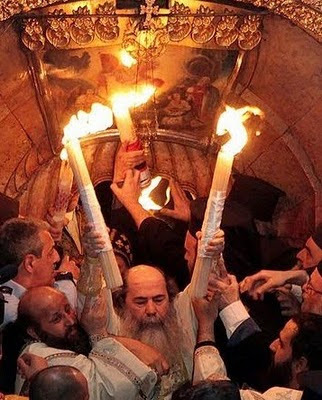 In an interview with the National Herald, Patriarch Theophilos of Jerusalem answered a few questions of interest regarding the annual miracle of the Holy Light (Holy Fire) which is celebrated in the Holy Sepulchre every Holy Saturday afternoon. "All the various perspectives and theories regarding the Holy Light come from people who are in complete ignorance, they have no religious sentiment even when they are disputed, and they do not want to receive the mystery of the divine economy, namely the Incarnation, beyond which I think all other things are redundant." "The ceremony of the Holy Light is part of all the ceremonies and mysteries of our Church. The ceremony of the Holy Light is the sole and exclusive privilege of the Church of Jerusalem as this ceremony takes place at the specific site of the Crucifixion and Burial, and especially the Resurrection of Christ, in other words in the new tomb." He further explained that the Touching of the Holy Light "is a Mystery of the Church, it is a ceremony." "What occurs then occurs in the whole world, it is the experience which a person receives when they participate in the Mystery of the Divine Eucharist." For more on the Holy Light 2010, see here.